11:30 h.- Official inauguration. Feria Valencia Center Forum. 12:00 – 13:00 h.- V awards ceremony Edition Concurso Neolith® Top Fabricator Design Competition . Agora SICI. + Info here. Juan Luis Salvador, CEO Antal, AMC president and Hall Area Kitchen SICI. It is the online sale a threat or an opportunity? What do we expect distribution? Moderator: Cristina Revert, Section Market Analysis and Strategy AIDIMME. 16:00 – 17:30 h.- distributors day Antalia. Feria Valencia Castellon Room. The challenge of software. Speaking the same language? Moderator: Mª José Núñez, Section responsible for Information Technology AIDIMME. Marisa Carrió (Focus editor Stone). 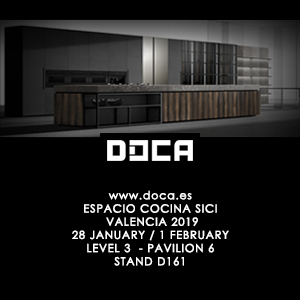 12:00 – 13:30 h.- Forum: 'The kitchen, the heart of a sustainable attitude in the family '. new appliances: vs more demands greater energy efficiency. Connectivity and automation: How you can contribute to a more responsible use of resources?. How to adapt the professional kitchen to the domestic sphere? Giandomenico Galeandro, Dtor. Whirlpool Kitchen Shopping Channel EMEA. Santiago Molina Cruzate, Program Director Environmental Institute. Cristina Ferrer (influence). 'Planning in the kitchen, sustainability and efficiency (cooked, food preservation, purchase, habits ...)’. Agustín Soriano Caballer, Mobalco distributor in Valencia and expert in sustainable architecture engineer. Every day of 10:00 – 14:00 h. Y 16:00 – 18:00 h.
NEFF Experience Area. Demonstrations vacuum packaging module and oven Slide&Hide. Tasting vacuum cooked snacks. NEFF Pop Corn Points. Shows plate extractor integrated. Try all the flavors of popcorn, ¡son 6 different! NEFFresh Point. Refréscate, rests and leave a message in refrigerating slate finish. *Agenda subject to last minute changes.